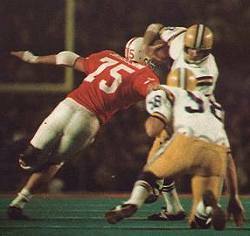 A star at defensive tackle on Nebraska's 1970 and 1971 national championship teams, Larry Jacobson became Nebraska's first major award winner when he captured the Outland Trophy after his senior season in 1971. It was the first of the school's eight Outland trophies, awarded tp the nation's top interior lineman. As a senior, Jacobson earned All-Big Eight and All-America honors as he helped the Blackshirts to top-five national rankings in rush defense (85.9, second), total defense (202.9, fifth) and scoring defense (8.2, third) en route to a 13-0 record and a second consecutive national championship. He also was named an Academic All-American. 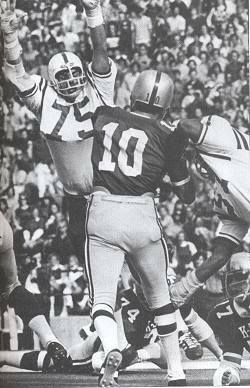 One of three Huskers selected in the first round of the 1972 NFL Draft, Jacobson was a first-round selection (No. 24 overall) by the New York Giants. He played with the Giants for four seasons, retiring after the 1975 campaign. Not what a QB wanted to see.